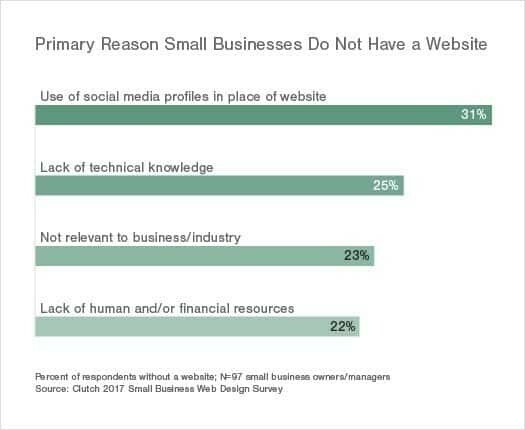 Nearly one-third of small business owners run their business without a website, and some indicate they will probably never have one, according to a new survey from Clutch, a leading B2B ratings and reviews firm. The survey found that 31% of small businesses choose to use social media profiles rather than a dedicated website to cultivate a web presence. Others (23%) cite a lack of industry relevance as the primary reason for not having a website. However, experts stress that a website is not only beneficial in every industry but also necessary. In the digital era, Internet searches are increasingly replacing cold calls and other non-digital lead generation. Without a web presence, it is difficult to compete for the Millennial and Gen-Z market. The Clutch survey also reveals that location is indicative of whether a small business has a website. Only 58% of Midwestern small businesses have a website compared to the South (72%), the Northeast (73%), and the West (77%). Experts interviewed about the survey findings attribute the lack of small business websites in the Midwest to a common perception many industries in the Midwest have toward the Internet: they tend to view websites as a waste of time, since traditionally, their leads come from word-of-mouth referrals. In addition, the Midwest has traditionally been slow to cultivate a culture of tech startups similar to Silicon Valley in California. Those small businesses that do build websites place an emphasis on mobility and search engine optimization (SEO). Nearly 80% of small business websites are now mobile friendly, one of Google’s major requirements for websites attempting to rank highly in their search algorithm. The survey included 355 small business owners/managers across the United States. Respondents answered questions regarding their experience with website ownership as a part of the 2017 Small Business Digital Marketing Survey. 40% of respondents’ companies have 10 or fewer employees; 27% have 11-50 employees; 25% have 51-250 employees; and 8% have 251-500 employees. 50% have an annual revenue under $1 million.